Thanksgiving is just a week away and turkey will once again be the centerpiece of this culinary celebration. In the past, I have written about the versatility of turkey to be successfully matched with red or white as well as light or full-bodied wines. The reason this is possible is because turkey has a variety of flavors, colors and textures which can match just about any wine. Add to these dimensions, the manner in which the turkey is prepared (i.e., roasted, smoked, grilled or fried) and the type of stuffing used, and you have a complex set of flavor components that make matching wine with it fun. Indeed, we should give thanks for this rare opportunity to sample several different wines with the same holiday meal. Conventional wine wisdom dictates that white meat should be accompanied with white wine. Well, in the case of Thanksgiving turkey, that is only partially true. From an herbal sauvignon blanc (which pairs nicely with a sage-flavored bread dressing), to a medium-bodied, yet rich, Alsatian riesling, to a lighter-styled pinot grigio, to a creamy, full-bodied chardonnay, turkey can accommodate each of these white wines quite nicely. But what really surprises some wine purists is how well turkey matches with red wine, particularly when the bird has been roasted on a grill or smoked. Full bodied reds like cabernet sauvignon, Rhone wines such as Chateauneuf Du Pape, along with zinfandel, shiraz or Amarone go especially well with smoked or grilled turkey. 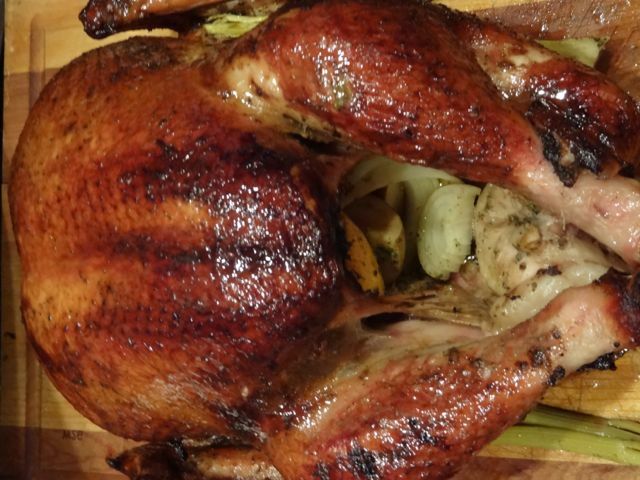 Check out my grilled and veggie- stuffed turkey on this page from last Thanksgiving. The traditional oven-roasted turkey is also very nicely accompanied by a pinot noir, Beaujolais or even tempranillo from Spain. And, given the celebratory nature of Thanksgiving, sparkling wine and Champagne would be an appropriate match too. And what about a dessert wine with that pumpkin pie? Well, I’ve got a few goodies for your sweet tooth that will pair especially well with this traditional dessert. So here are some vinous ideas for you to consider as you plan your Thanksgiving dinner. A Sparkler to prep you palate: Gloria Ferrer Blanc de Noirs, Schramsberg Brut, Iron Horse Russian Cuvee, Segura Vidas, Zardetto Prosecco or Laetitia Brut Rose would tickle and tingle your palate and get you primed for the meal to come. Whites: St. Supery Virtu, Trimbach Pinot Gris, Kenwood Sonoma Chardonnay, Clairborne & Churchill Dry Riesling, Jean –Luc Colombo Cotes Du Rhone Blanc, Pierre Sparr Gewurztraminer, Talley Vineyards Chardonnay and Medlock Ames Sauvignon Blanc. Reds for the National Bird: Louis Martini Napa Cabernet Sauvignon; Zonin Amarone Di Valpolicella, Banfi Rosso Di Montalcino, Beaucastel Chateauneuf-du-Pape, Ridge Geyserville Zinfandel, MacMurray Russian River Pinot Noir; Domaine Serene Yamhill Cuvee Pinot Noir and Georges Duboeuf Morgon Beaujolais. For Dessert: Rosa Regale Brachetto, Michele Chiarlo Moscato, Navarro Late Harvest Riesling, J Vidal-fleury Muscat de Beaumes de Venise and St. Hillaire Blanquette de Limoux.